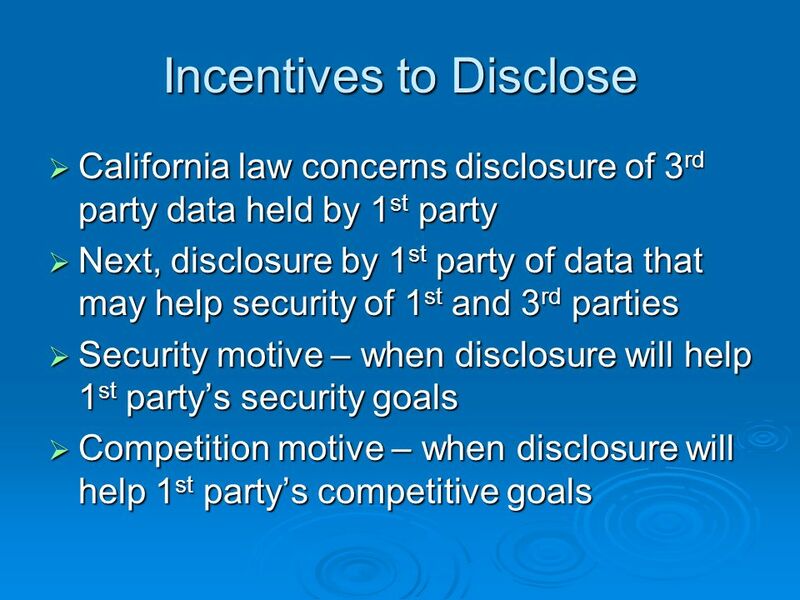 Security Market: Incentives for Disclosure of Vulnerabilities Peter P. Swire Ohio State University Houston/Sante Fe Conference June 4, 2005. 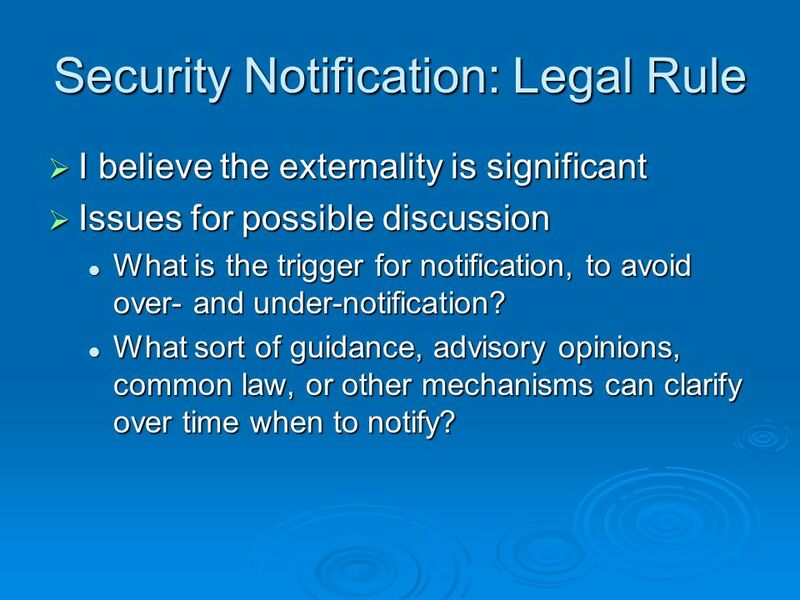 9 Security Notification: Legal Rule I believe the externality is significant I believe the externality is significant Issues for possible discussion Issues for possible discussion What is the trigger for notification, to avoid over- and under-notification? What is the trigger for notification, to avoid over- and under-notification? 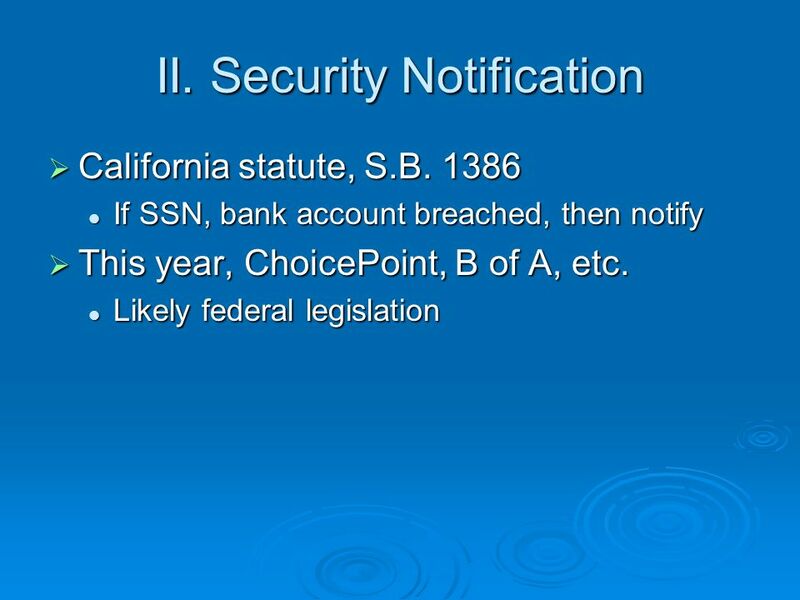 What sort of guidance, advisory opinions, common law, or other mechanisms can clarify over time when to notify? What sort of guidance, advisory opinions, common law, or other mechanisms can clarify over time when to notify? 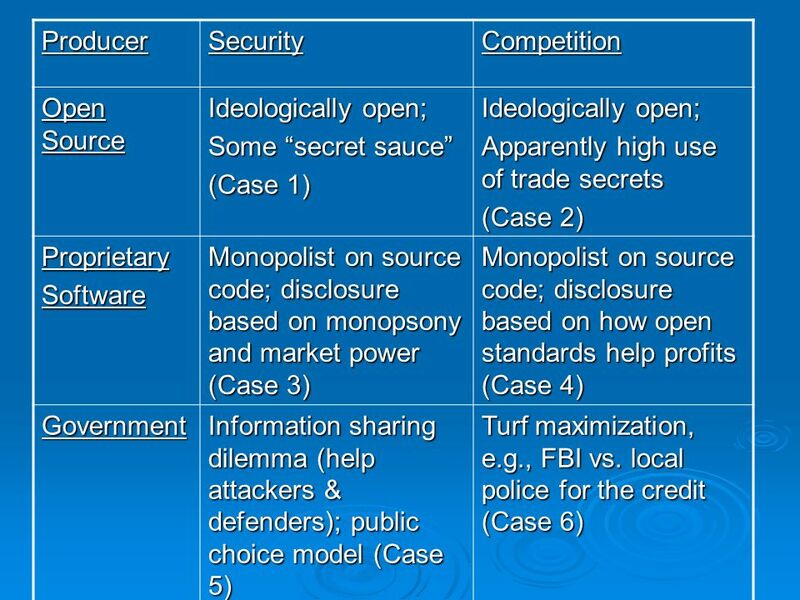 18 Open Source & Proprietary Greater secrecy in Open Source than usually recognized Greater secrecy in Open Source than usually recognized Secret sauce for security Secret sauce for security Trade secrets in services Trade secrets in services Greater openness in proprietary than usually recognized Greater openness in proprietary than usually recognized Monopsony power, governments, reputation Monopsony power, governments, reputation Financial gains from at least partly open standards Financial gains from at least partly open standards Convergence of the two approaches when it comes to disclosure? 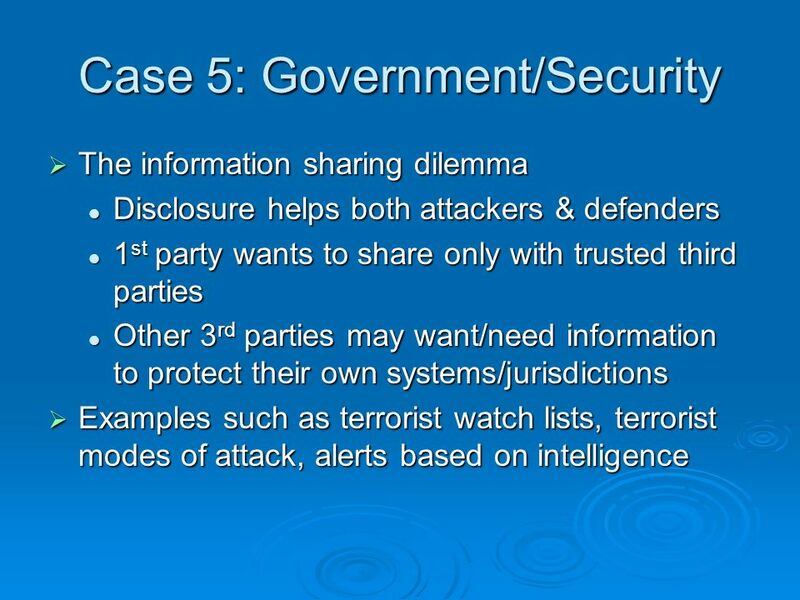 Convergence of the two approaches when it comes to disclosure? 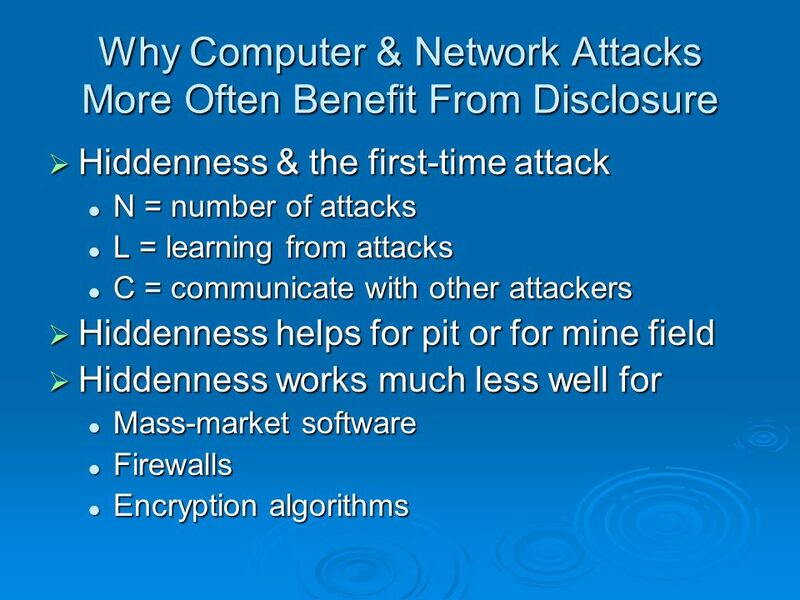 Download ppt "Security Market: Incentives for Disclosure of Vulnerabilities Peter P. Swire Ohio State University Houston/Sante Fe Conference June 4, 2005." 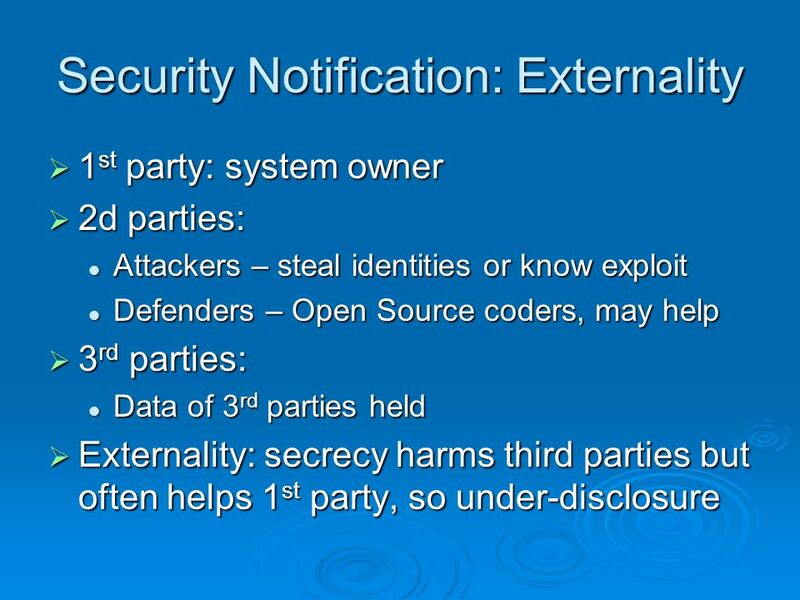 A Model for When Disclosure Helps Security: What is Different About Computer & Network Security? Peter P. Swire Ohio State University George Mason CII. 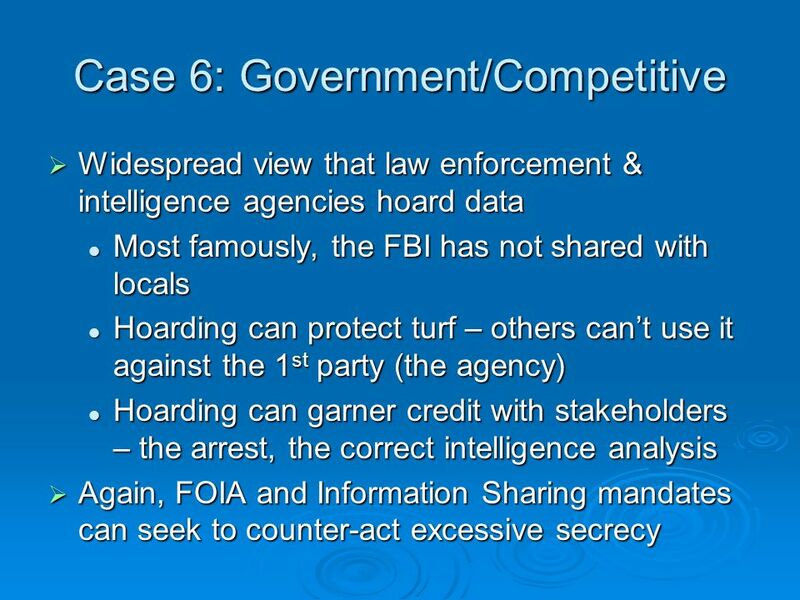 Better Security and Privacy for Home Broadband Peter P. Swire Moritz College of Law The Ohio State University Morrison & Foerster LLP Privacy 2002 Conference. Security Through Obscurity: When It Works, When It Doesnt Peter P. Swire The Ohio State University DIMACS, Rutgers January 18, 2007. 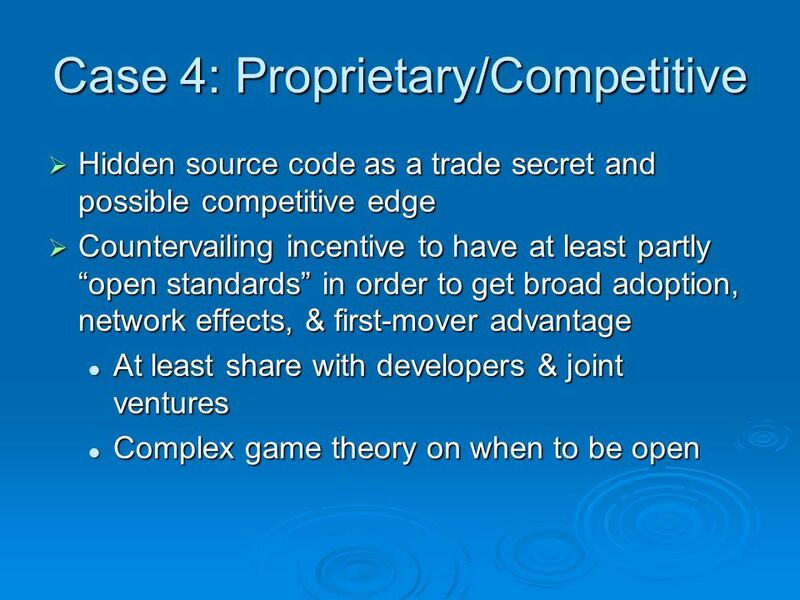 What Should be Hidden and Open in Computer Security: Lessons from Deception, the Art of War, Law, and Economic Theory Professor Peter P. Swire George Washington. 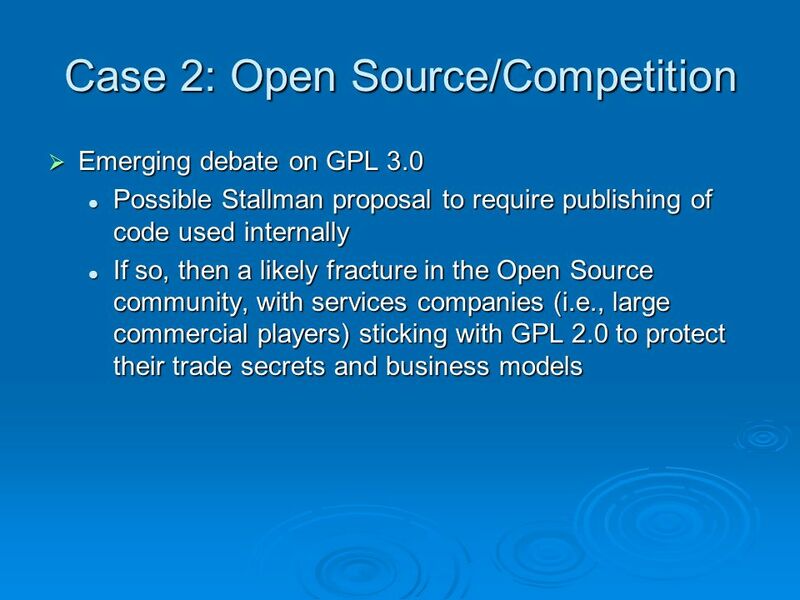 Free/Libre & Open Source Software and When Disclosure Helps Security Peter P. Swire Ohio State University Western Ontario: Free/Libre and Open Source Software. 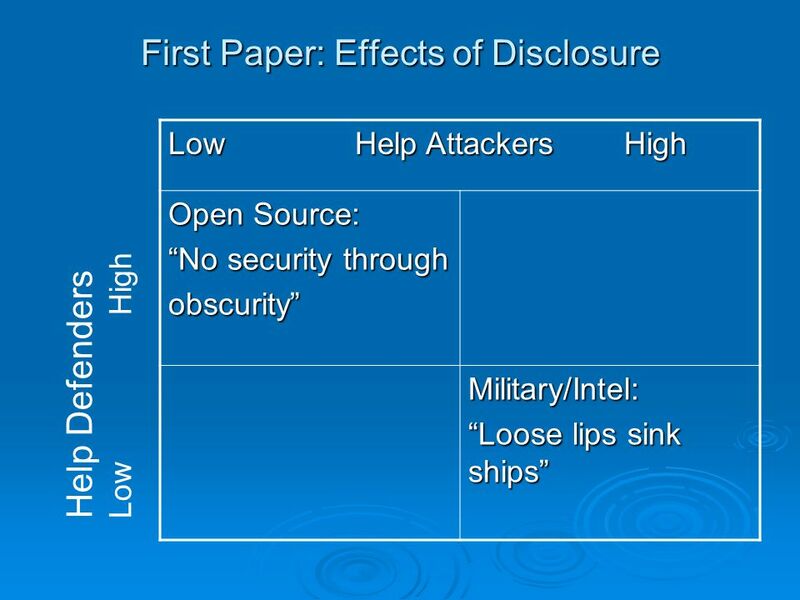 A Model for When Disclosure Helps Security Peter P. Swire Ohio State University Stanford Cybersecurity Conference November 22, 2003. IMPS Information Management and Policy Services Information Services Directorate A briefing for all University staff November 2004 New Information Legislation. Data Protection Law In India iPleaders and Intelligent Legal Risk management LLP. Security Through Obscurity: When It Works, When It Doesn’t Peter P. Swire The Ohio State University DIMACS, Rutgers January 18, 2007. Ethical, Social and Environmental Responsibilities Unit 3 June 20131Dr Vidya Kumar. Allison Dolan Program Director, Protecting PII Handling Sensitive Data - WISP and PIRN. EQUITY VALUATION: APPLICATIONS AND PROCESSES Presenter Venue Date. Copyright © 2008 by Nelson, a division of Thomson Canada Limited ENTREPRENEURSHIP A PROCESS PERSPECTIVE Robert A. Baron Scott A. Shane A. Rebecca Reuber. 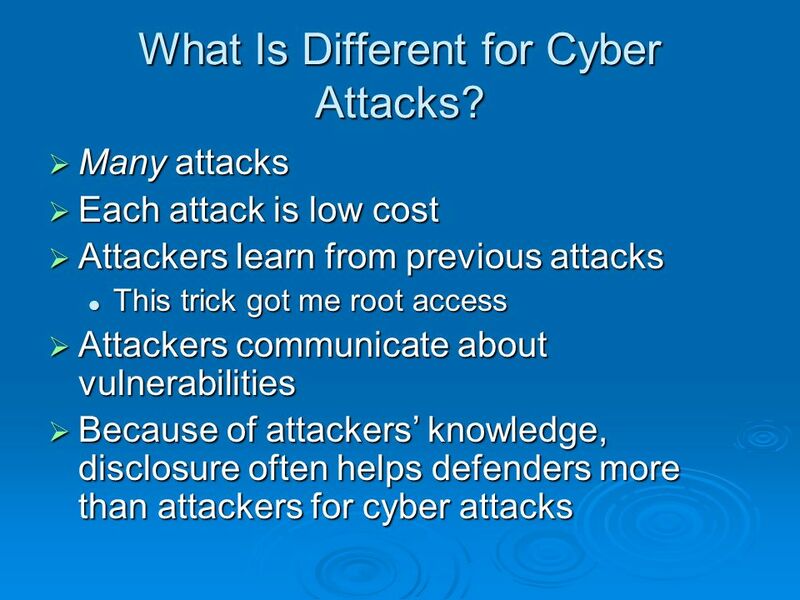 Center for Risk Management of Engineering Systems University of Virginia Linking the Economics of Cyber Security and Corporate Reputation Barry Horowitz.